Summer is fleeting and always fills up too quickly with plans. Do you notice that? I’ve had very few weekends since June without some kind of something going on. I’ve loved every planned, filled and busy minute, really. And I know that this summer has probably been extra busy because Michael is moving at the end of it all. We’re cramming. Aside from all that, the moments that stick out the most for me have been the quiet ones, unplanned or regular and weekly. I guess I’m a girl who likes routine and the familiar. I spent an entire quiet afternoon and evening in the kitchen, watching transformations happen with just Mira and my iPod for company. 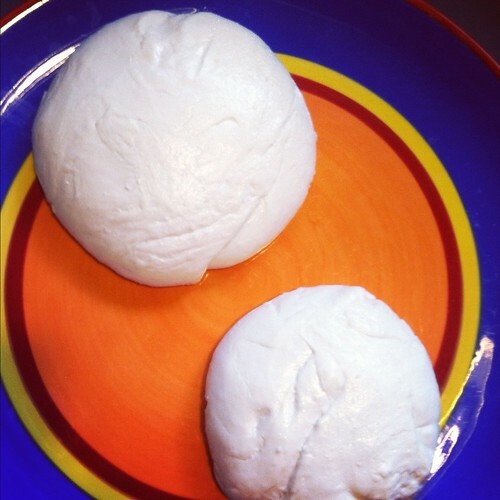 homemade mozzarella cheese started as milk! 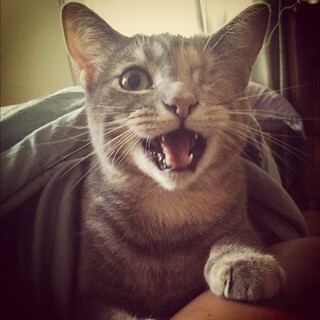 I lounge in bed with Mira and Lola on weekend mornings for at least half an hour before getting up. Mom and I go to yoga twice a week. Mother daughter relaxation detoxification time. Saturday is farmer’s market day. We started this last summer…getting up, riding our bikes to Broad Ripple High School, and shopping. Well, I shop, wander from stand to stand, gush over tomatoes and berries, and Michael follows along, agreeing that we could have sweet corn for dinner this week. I love moving through the dogs and people, selecting fruits that we sometimes can’t wait to eat til we get home. This summer we’ve also been frequenting a particular ice pop stand, Nicey Treat. 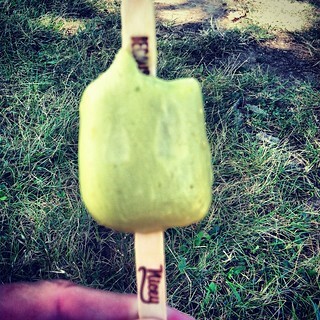 Avocado, pineapple-basil, mango-ginger, key lime pie…perfect on a hot day. I can judge the passing of summer by the fruits at the farmers market. Strawberries mean the beginning of summer, but they go quickly. Raspberries mean summer is in full swing, but you can’t expect them to hang around too long either. Blueberries and blackberries show up at the same time and stay for awhile. But peaches, they’re my favorite, and thank goodness that they come with the strawberries practically and stay all summer long. When peaches made their first appearance at the market, I bought an obscene amount. I kind of went crazy. In fact I’m pretty sure the girl thought I was nuts. Good thing I bought that many though. We ate a few fresh and right away. This summer marks Michael’s first experience with a fresh peach. He’s finally living for real. The rest of the peaches I promptly turned into peach butter. Peach butter is magical. It’ll create those perfect routine and quite summer moments for you. How can it not? It’s peachy, sunny, barely sweetened, and so easy. Peaches, a bit of sugar, a squeeze of lemon juice, a pinch of ginger in a pot. I could easily go through an entire batch in a few weeks, but I try to savor the stuff. I’ve even gotten into canning, and make a few jars to last me through the winter. Canning isn’t hard. I cross my heart. Promise. I’ll tell you how to do it. Actually Deb of Smitten Kitchen will tell you how to do it, but I’ll put it here on my site so you don’t have to click around and around the web. So please, make some peach butter, enjoy a quiet summer moment with it spread on toast, a biscuit, pancakes or right from the jar. Then get back to cliff jumping, road tripping, and concert going! Cut a small “x” in the bottom of each peach. If your peaches are nice and ripe, they skin will peel off pretty easily. If that’s not working out, dip each into a pot of boiling water for 30 seconds, and then into a bowl of cold water for a minute. The peels should slide right off. Halve your peaches and remove the pits. Cut each half in half again (you’ll end up with four quarters per peach). Place peach quarters and water in a large pot and bring to a boil. 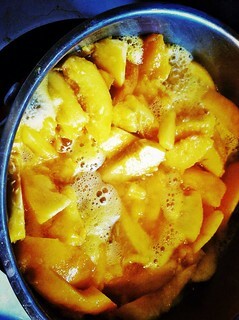 Simmer until peaches are tender, about 15 to 20 minutes, stirring occasionally to ensure they cook evenly. Puree the peaches in a food processor or blender or use an immersion blender directly in the pot until you get the texture (smooth, chunky, or somewhere in between) that you like. Return the peaches to the large pot, add the sugar, lemon juice, and ginger and bring the mixture to a good strong simmer/gentle boil, cooking them at this level for 30 to 40 minutes, stirring occasionally in the beginning and more often near the end, as it thickens up and the fruit risks scorching on the bottom of the pot. Beware that some splattering may happen! There are several methods to test for doneness: You can drizzle a ribbon of sauce across the surface; when that ribbon holds its shape before dissolve into the pot, it is done. (This is my preferred method.) Some people use cold or frozen plates; dollop a spoonful in the middle of one and if no water forms a ring around it in a couple minutes, it is done. Others use a spoon; if the butter remains rounded on a spoon for two minutes, it is done. You can also check the pot itself; the butter is usually done when a wooden spoon leaves a clear train when scraped across the bottom. Let peach butter cool (unless you’re canning it, in which, follow the directions below). 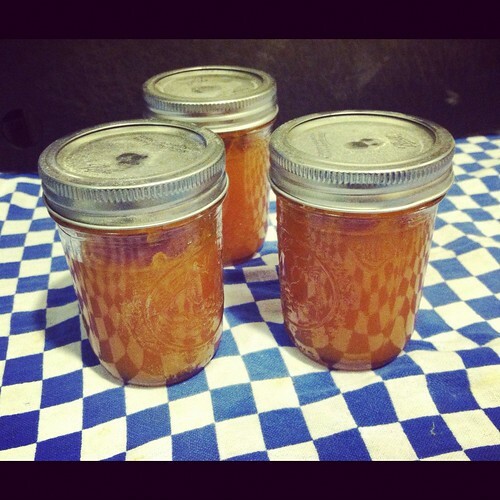 If you’re not canning it, keep it in an airtight container in the fridge. It should be good for at least two weeks. First, sterilize your jars, either by boiling them in a large, deep pot of water (which should cover the jars completely) for 10 minutes or washing them in lots of hot soapy water, rinsing and drying the parts well and then place the jars only in a 200 degree oven for 20 minutes. I go with the oven oven option. It’s easiest and least intimidating for me. Divide your hot hot peach butter between your jars, leaving a little room at the top. Wipe the rims clean with a dry towel and cover the jars with their lids. Submerge the jars in a large, deep pot of boiling water for 10 minutes, either in a removable basket or using tongs to dip and remove them. Let cool completely on towels, a process that can take overnight. You’ll know the canning process worked when the lids pop down to form a seal. 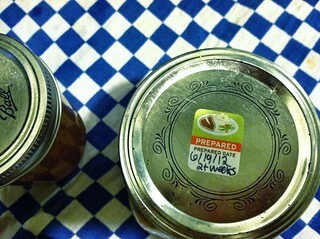 If canned properly, the peach butter should last indefinitely at room temperature.